Cutting your overdraperies does not differ greatly from cutting glass curtains. Much depends on understanding your material. Just as a good carver understands Ms wood, you must work with the weave of your fabric, hanging your curtains straight with the warp and woof. Many materials come from the factory with the fabric rolled more tightly at one end than at the other, so that the horizontal (woof) threads are crooked, and this happens particularly in the case of loosely-woven materials and linings. When you have removed the selvages, it is a good idea to ask some one to take the other end, holding the fabric with both hands as you would a blanket you wanted to shake out, and pull it gently from corner to corner. Be careful not to injure or wrinkle the material This will straighten the threads. Press the fabric before sewing, so that it will be easier to work with. As with glass fabrics, cut on a woof thread: keep verifying your measurements with a tape measure as you go along. You will probably save time if you cut all your panels at once. 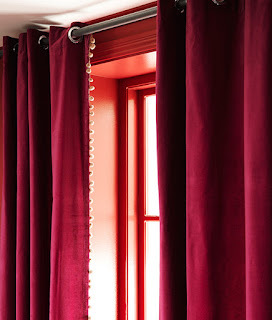 Casings, headings and hems on draperies are made in the same way as outlined in the discussion on glass curtains. Hems at the bottom for draperies may be wider if a heavier fabric is used to hide metal weights. It is generally agreed that unless draperies depend on sheerness for effect, they should be lined. Linings not only protect the fabric from exposure to weather and sun, but also help the draperies to add warmth to the room. Even though nowadays windows are weather stripped, frames fit better than in the past, home insulation methods have improved, and fabrics can stand up against the aging effects of weather, linings are still valid in older homes and are still good for many fabrics. Besides, linings help the draperies to fall in richer folds. Sateen, the most widely used lining material, is usually a cream color, but if your drapery is very white, you can get white sateen. For richer fabrics you can use taffeta, and for taffeta draperies use a silk mull or taffeta lining. Satin is recommended as a good lining fabric for velvet, but it is costly. As mentioned in the chapter on measurements, your lining fabric is, to begin with, the same width and length as your drapery material. You will want to cut it so that it is 2 inches shorter at the top than the drapery fabric, and 3 inches shorter at the bottom hem, as well as at least 2 inches shorter than the sides. Cut all the lining panels to these measurements at the same time, and cut the selvages from the lining. To insure that the lining and drapery will hang straight and not be drawn at the edges, notch both materials about every 5 or 6 inches. Now fold your lining in half and lengthwise, so that it is divided evenly. Crease down the middle and baste a seam, down the crease. Then lay the basted lining on the wrong side of the fabric, still folded, so that the basted line will be centered on the fabric. If the lining were open to its full width at this time, you would have 2 inches of drapery fabric extending beyond the lining on either side, 3 inches at the top and 2 inches at the bottom. Now with the lining still folded, catch stitch your creased, basted line to the center of the drapery fabric, thus anchoring your lining into place. Unfold and turn the top edge of the material over the lining and baste, using long and short stitches. Turn the side edges in, and baste. Turn up the bottom hem, not in a single turn, but a hem, and catch-stitch this into place, using a strong thread if your material is heavy. Use a mitered corner. Your lining will now fall below the top of the hem and it, too, gets turned up and stitched. 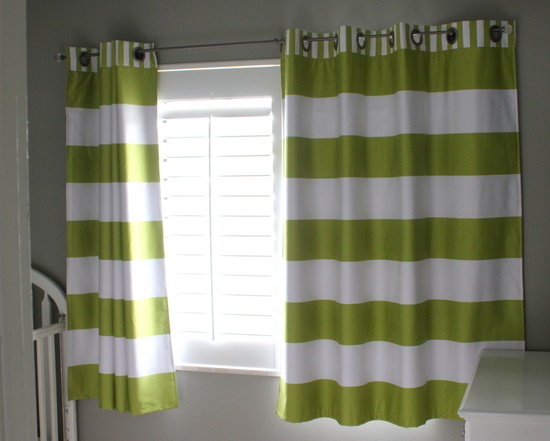 The lining should end, when finished, less than an inch from the bottom of the curtain. Catch the sewing line of the lining hem and that of the material together with long loops, so that the drapery and lining can be detached easily for cleaning. For an even warmer and heavier drapery, you can interline with cotton flannel. To do this, cut your interlining to finished drapery dimensions, and fold in same manner as the lining, tacking the interlining loosely to the wrong side of the drapery material in the exact center. Then divide each side of interlining, basting the edges and catch stitching the bottom hem. The outside lining can then be tacked to the center of the interlining, and slip stitched to the interlining material along the hem edge. Interlinings, however, are rarely used, as they make a drapery difficult to clean and are very heavy. They are used in very formal rooms, and add considerably to the draping quality of the fabric. For picture-window draperies special treatment is needed, since it is necessary to seam together enough widths of fabric to draw the draperies together. To do this, measure twice the width of the window and seam together enough sections of fabric to cover it. Cut a matching number of lining panels, seam them together, and sew to the fabric along the top edge and outside edges. Hem the lower edges separately. With this type of drapery or any heavy drapery, such as one with interlining, there may be a tendency for the material to sag away from the lining unless caught at intervals every few inches with loose tackings. This tacking can be put on after the lining has been pinned in, with a long, lengthwise stitch. To do this, unpin the lining on one side and fold it back so that the two wrong sides are exposed. Catch the two together with a basting stitch that won't show on the right sides of either lining or drapery. Make knots frequently. Then repin and sew lining and drapery hem as described.